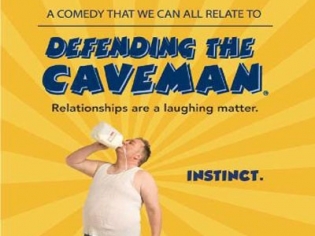 Defending the Caveman is a hilarious one-man comedy show. Comedian/writer Rob Becker explains why we shouldn't think of men as a-holes! Buy your tickets now to save up to $23 per ticket. Save up to $29 on tickets when you book online today. Tickets for Defending the Cave Man Start at just $25/pc before taxes and fees. The long-running, prize-winning one-person show at The D is a hilarious look at the differences between men and women. Any couple, married or not, will enjoy the “That’s you!” moments as you chuckle at the way men and women view the world differently. This comedic monologue with the ”Me Man, You Woman” humor hits home with most couples. It will make you chuckle for the entire performance as the humor hones in on the differences between men and women in ordinary life. You will find yourself elbowing your partner as you recognize the characteristics, which you are chuckling over. The humor reaches across generations and makes the entire audience laugh in appreciation of the true observations of how men and women differ. You may even leave with a new understanding and appreciation of how your spouse thinks! The performance manages to be both insightful and witty as the habits and instincts of men and women are both mocked and celebrated. A good way to spend an evening laughing at yourself! I thoroughly enjoyed the show. Went on a double couples date and we were all laughing out loud at some of the things they said about men. We bought tickets for a matinee at the suggestion of a concierge, and it was one of our favorite shows. Tickets were around 45 a piece for the Sunday matinee and included tshirts. It was not packed so our seats were immediately upgraded. My husband and I went with another couple and although we were a little leary the first few minutes he had us in stitches soon after. It was a humorous comparison of the differences between men and woman and in the end he rounds it all out with a very heartwarming conclusion. I would suggest this for any couple out there that likes to laugh. Even though I’m sure the content doesn’t change I would love to go to this one again. This show truly is defending a males point of view and makes everyone laugh. It’s okay if you get a big discount but nothing great or historical one man show. Only go if you are married or living with someone.